Stirling I N6013 shot down over the North Sea on 1/7 1941. The Stirling belonged to RAF 7 Sqn. Bomber Command and wore the letters MG-A. T/O 12:00 Oakington. OP: Daylight operation to Borkum. Three Stirlings, N6013 with F/O J. Kinnane, N6005 with F/O D. T. Witt and N3655 with Sgt B. K. Madgwick, were detailed to attack the Borkum seaplane base by daylight with 16 x 500 lbs each. Bursts were seen across the harbour and on the slipway. They met a considerable defence of fighters. From German side Uffz Summerer from 3./JG52 claimed a Stirling at 14.00 hrs some 15 km West of Borkum. Another claim was made at 14.05 hrs by Uffz Brey of 1./JG52 North of Borkum. No Stirlings were lost at that moment, however. On the return flight F/O Kinnane discovered a dinghy with the crew of Blenheim V6258 of 139 Squadron some 60 km Northwest of the Isle of Friesland. They were shot down at 12.48 hrs by Fw Friedrich Bachmann, 3./JG3 operating from Leeuwarden. F/O Kinnane decided to circle the dinghy and sending a SOS. This was received in England and at 16.00 hrs local time the HSL 108 left its base Gorleston. Meanwhile two Ar.196’s of 1,/BFlSt196 operating from Schellingwoude, returned from a more western area in which they were hunting submarines. Flying on 400 mtrs they encountered the Stirling which was seen from 3 km distance flying slowly from South to East and to North. Hptm Schmidt and his Bordfunker Fw Hastings manoeuvred their Arado at an angle of 30 degrees under the left side of the Stirling. Flying 50 metres lower they approached the Stirling and pulled up in a left turn. From 300 to 50 metres Hptm Schmidt fired 22 x 20 mm shells and saw strikes in the front part of the fuselage and in the wing between the right inner engine and the fuselage. Hptm Schmidt pulled the Ar.196 horizontal and passed 20 metres underneath the Stirling, to give Fw Hastings the opportunity to fire his weapon, which jammed, however. The other Stirlings witnessed this attack at 15.11 hrs local time. The crew of N6005 were apparently very surprised and the Stirling flew to the West. The second Arado crewed by Oblt Stav and his Bordfunker Ofw Stürtz, then manoeuvred his Arado in attacking position above and left from the Stirling. Diving in an angle of 50 degrees he attacked the Stirling from 400 metres, strikes being observed in the left engines and fuselage to the rear turret. The Stirling dived, chased by Oblt Stav who fired another bursts with his machine guns, resulting in trails of smoke coming from the Stirling. Then 2 Bf.109’s appeared on the scene and Oblt Stav requested Ofw Stürtz to fire some ES flares. Nevertheless, one of the Bf.109’s dived upon the Stirling without attacking it. Some time later 4 Bf.110’s of 6./ZG76 also appeared. Finally the Stirling crashed in flames upside down in the North Sea. The landing gear was visible for some time before the wreckage sunk. Oblt Stav and Ofw Stürtz were credited for the victory, although Lt Hauff and also Uffz Arngrimm made a similar claim on this Stirling at respectively 15.20 hrs and 15.21 hrs 100 km W of the Isle of Vlieland. There were no survivers. The other two returning Stirlings were also attacked by Bf.109's. Stirling N6005 was attacked 4 times, but rear gunner P/O J. L. A. Mills, although hit in his arm and bleeding seriously, managed to shoot the Bf.109 down. There were no Luftwaffe losses, but two Bf.109's of 1./JG52 crashed during the landing on airfield De Vlijt on the Isle of Texel. This concerned Werknr 8197, flown by an unknown pilot, the other one Werknr 8129 flown by Uffz Georg Brey. Both aircraft sustained 35% damage. On 6/7 five Danish fishing vessels was attacked 50-60 miles west of Esbjerg by a number of British Blenheim aircrafts of which Z 7272 of 226 Sqn hit the mast of E 67 “Alice” and crashed into the sea. Just before the crash a flyer left the Blenheim and fell to the sea. He was retrieved from the sea by the vessel “Lajla” but was found to be dead from severely injuries. It has later been reported that his face was severely damaged. The body was taken to Esbjerg and handed over to the German Wehrmacht who laid him to rest in Fovrfelt cemetery in Esbjerg on 11/7-1941 as an unknown English flyer, RAF in AI Stk. Row 9 Grave 22. 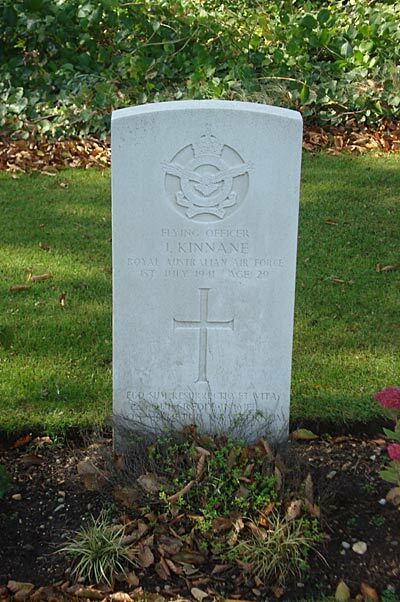 After the war the body was identified by the British armed forces as being that of Pilot F/O John Kinnane MiD RAAF. W/OP-Air Gnr. 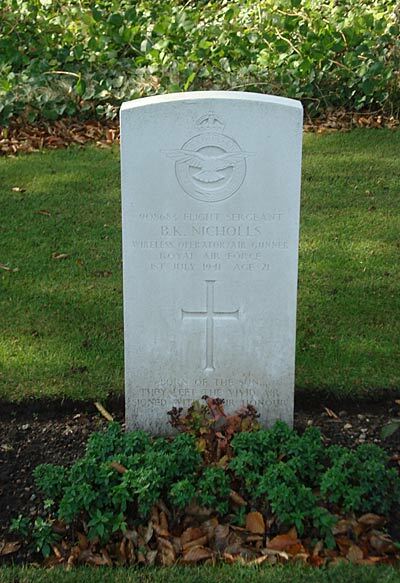 F/Sgt Barrie K. Nicholls was found on August 15 , 700 meter to the south of the mouth of the river Kongeaen, and was buried in Gravlunden cemetery in Esbjerg on August 18 1941. Flt. Engr. 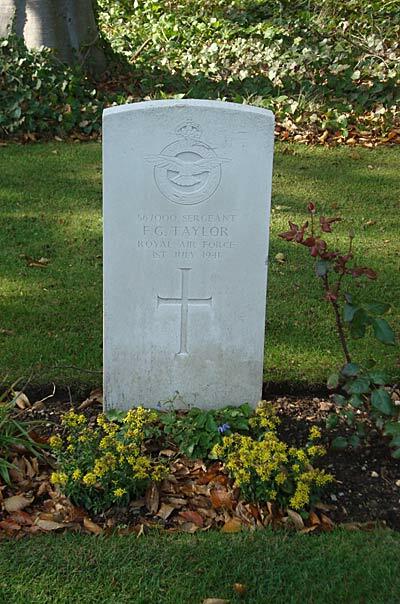 Sgt Frederick G. Taylor was found drifted ashore near Rejsby and laid to rest in Fovrfelt cemetery in Esbjerg on September 18 1941. The remaining crew, which consisted of 2.Pilot P/O James G. Elliott RCAF, Navigator P/O Thomas E. Bolton, W/Op Sgt Kenneth Huntley and Air Gnr. Sgt William G. Marsh have no known grave and are commemorated on the Runnymede Memorial. Sources : UA, BE, CWGC, BCL, AIR 27/98- AIR25/64-RL20/243 via Hans Nauta, Holland.